This thermistor based module has a NTC temperature sensor which gives digital output that allows you to easily add over-temperature and under-temperature condition sensing capabilities to your new project. 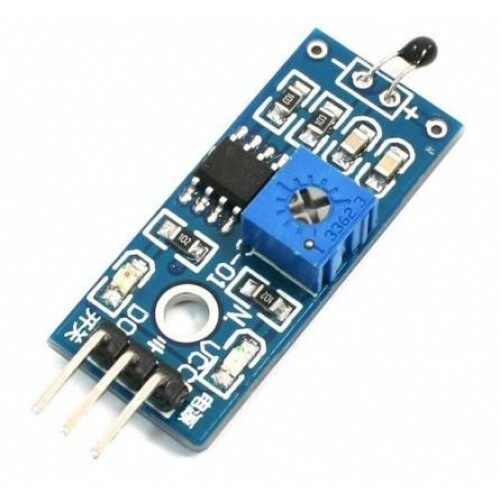 Ky 028 temperature sensor Module can be directly interfaced with Arduino or Raspberry Pi. Don't need essentially an Arduino for this project. The temperature detection threshold is adjustable via potentiometer. It uses the LM393 based voltage comparator chip which features a clean and stable digital output signal and a driving ability of 15 mA. The DO output can be directly connected to the microcontroller, and it outputs a high or low level voltage depending on the temperature changes from the environment. The digital output can be used directly drive a relay module or as a thermostat switch for controlling external equipment, such as a cooling fan.